May 6, 205. In 2006 Cambodia adopted its Policy on Alternative Care for Children. The policy is based on the premise that children are best raised in families and in communities, and that institutional care should serve as a temporary stopgap and last resort. Later in 2006, the Ministry of Social Affairs issued a minimum standard for residential care for children as part of an effort to crack down on facilities that were implicated in child abuse or that otherwise fell short. Despite these measures, statistics provided by the ministry’s Alternative Care Database indicated an increase in the number of institutional care facilities by 75 percent, from 154 facilities in 2005 to 269 in 2010. The number of children in institutional care increased from 6,254 to 11,945 in the same period. According to UNICEF (2009), only 23 percent of those children were orphans. More recent statistics show a slight decrease in the number of institutional care facilities: from 269 in 2010 to 228 in 2014. However, the number of children in these facilities effectively remained the same during the five-year period, with 11,945 children living in institutions in 2010, and 11,453 in 2014 (Figure 1). So while the Cambodian government seeks to reduce reliance on institutions for children requiring alternative care, the number of children living in such facilities appears to have remained more or less stagnant. A study conducted by the Ministry of Social Affairs (2011) has shown that there is both ample supply and demand for placing children in institutions. As the UNICEF figure of 23 percent suggests, not all children living in orphanages are orphans. In the 2011 study, families cite poverty, along with limited social protection and safety net programs, as reasons for placing their children in orphanages. Some parents who put their children in institutional care do so because they believe it will give their children access to a better education and a brighter future — even if this is often not the reality. Therefore, it is necessary that the government institute policies that address these concerns by providing families with alternatives that allow them to keep children at home. Furthermore, it is important to note that most orphanages are run by individuals or by non-governmental organizations that rely heavily on individual foreign donors. Due to the uncertainty of this funding stream, many orphanages have established links with the tourism industry, especially in two major cities popular among tourists: Siem Reap and Phnom Penh. While the overall number of institutional facilities in Cambodia may have declined over the last five years, they have actually increased in these two cities (Figure 2). Trained to perform shows for tourists, these children are often involved in raising funds for their own care and support. As with screening, there are currently no mechanisms to guarantee the effective management of donations. Some orphanages go to great lengths to display children in miserable conditions in order to attract more donations from tourists. 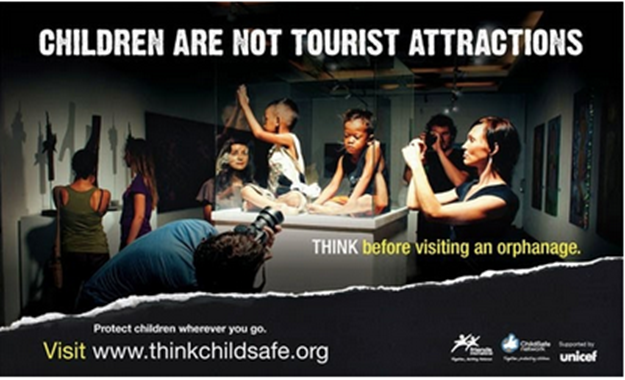 Orphanage-tourism is therefore contributing to the exploitation of children. The more we learn about the brain, the better we understand how much it can be negatively affected by the environment in which children grow. We have plenty of evidence to show that children should not be placed in institutions. Children under 3 in particular should never be placed in an institution if it can be helped. Without a clear vision and strategies, it is likely that instead of eliminating institutional care facilities altogether, Cambodia will actually see a rise in their numbers in the long term. The government needs to conduct a serious evaluation of existing centers and strictly enforce the 2006 policy and the minimum standard. Preventing placement in orphanages in the first place, along with de-institutionalization, should be equally prioritized. Promote more family and community-based care for children by expanding social protection measures, including social transfer programs. Target vulnerable families with the explicit objective of family preservation. Advocate and raise awareness with various stakeholders, including local authorities, donors, tourists and volunteers, about the adverse effects of institutional care for children. Link local authorities with community-based care programs and school-support programs so that they can help make families aware of the available support options that enable them to keep their children at home. Campaign to promote the practice of raising vulnerable children in home and in kinship care as an effective social norm. Alternative care in this case refers to care provided to children by agents other than their biological parents. The policy refers to two forms of care: (1) institutional or residential care (i.e., orphanages) and (2) non-institutional or community-/family-based care. Ministry of Social Affairs, Veterans and Youth Rehabilitation (2006), Policy on Alternative Care for Children. “Institutional care of young children is harmful to children’s development and negatively affects neural functioning at the most critical and unparalleled period of brain development, causing physical, intellectual, behavioral, social and emotional skill deficits and delays.” Browne, Kevin (2009). The Risk of Harm to Young Children in Institutional Care. Save the Children Fund, UK. Chivith Rottanak is a UNICEF child protection officer based in Cambodia and a Spring 2015 G. Barrie Landry fellow at Harvard FXB.